Yuankai Huo, Zhoubing Xu, Katherine Aboud, Prasanna Parvathaneni, Shunxing Bao, Camilo Bermudez, Susan M. Resnick, Laurie E. Cutting, and Bennett A. Landman. 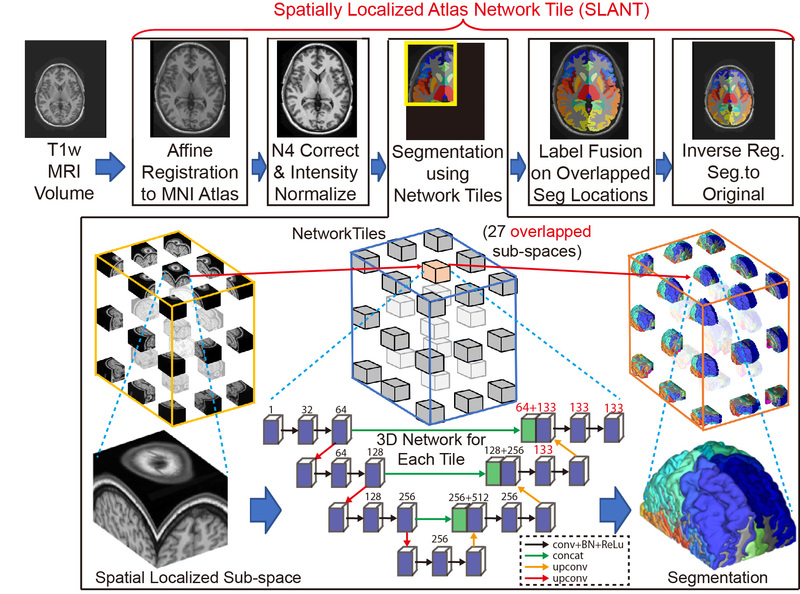 “Spatially Localized Atlas Network Tiles Enables 3D Whole Brain Segmentation from Limited Data.” In International Conference on Medical Image Computing and Computer-Assisted Intervention. vol 11072. pp. 698-705 Springer, Cham, 2018. This figure presented the network structure of the proposed SS-Net. From left to right, the network consisted of (1) Encoder, (2) Skip-connector, (3) Decoder,and (4) PatchGAN discriminator. The name of each network component was showed in the dashed legend box. Briefly, the ResNet50 was used as encoder. Thelarge convolutional kernels (LCK) with kernel size 7×7 were used as skip-connector. The boundary refinement layers and upsampling layers were employed as decoder. Using true intensity images, true segmentation images, and fake segmentation images, the PatchGAN functioned as the discriminator to supervise the training procedure. Finally, the Dice loss and the GAN loss were combined to derive the final training loss for the proposed SS-Net.